True to the forecast, the weather changes overnight. It is a grey, misty morning with rain in the forecast at 90% and winds of 30 knots. We are underway at 0925. We meet many fishing boats returning to port. We encounter winds of 15 kts but nothing more and the water is not too rough. We anchor in Snug Cove at 1617 which we have to ourselves. It is very grey and rainy and the forecast is quite bad so we decide to spend the day at anchor. Some wind but not much. I work on my photos and we watch a move in the evening. The morning is very calm with a mixture of sunshine and showers. We are underway at 0913. Conditions are good down Stephen’s Passage and into Frederick Sound. Chris is able to get on line to book a tour in Wrangell up the Stikine River for Louisa and myself on August 8th. We anchor in Portage Bay (3rd time) at 1527. Absolutely mirror calm morning with cloudless sky. Underway at 0852. Gorgeous morning up Fredrick Sound. 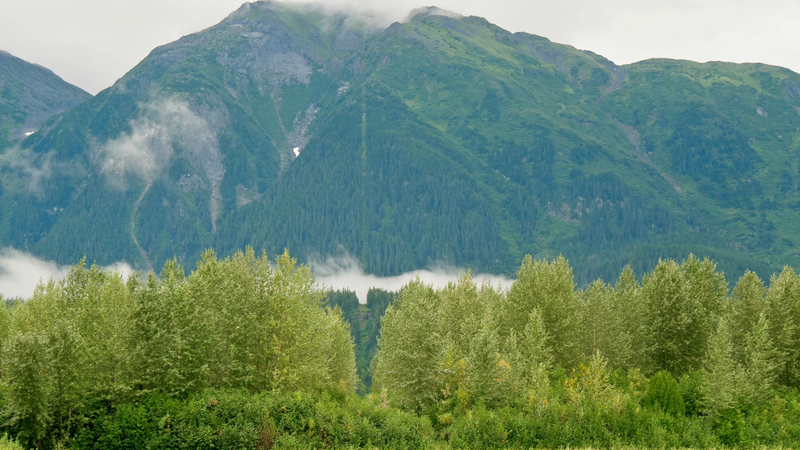 We enter Wrangell Narrows at Petersburg. I take photos of the town with the Devil’s Thumb in the background. We anchor in Keene Channel just off channel marker #11 at 1344. It is dead low neap tide so great care is needed to thread our way through the shallows. We have just 14ft of water under us at one point - considered ample in the Bahamas but not here! I fish out some drifting kelp and am impressed by its hollow construction and its length. I take some underwater video using my little Lumix TS5 camera at the end of the boat hook. Overcast but calm. We arrived in Heritage Harbor ,Wrangell at 1141. The people in next boat Ocean 40 said they are here because of my videos. It is always nice to here this. 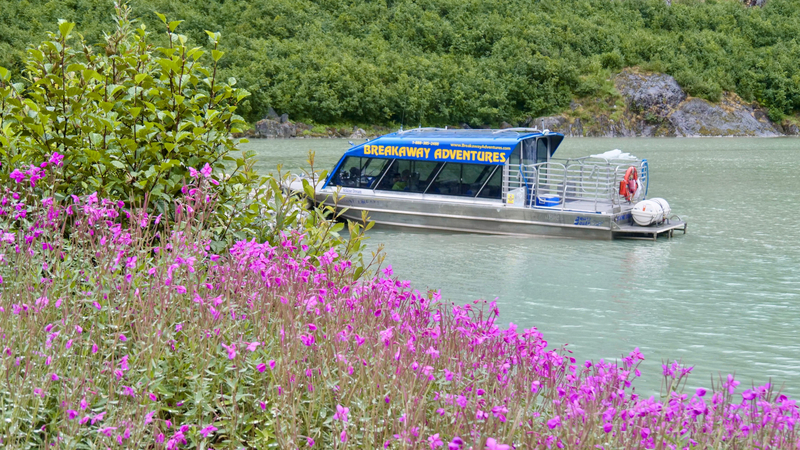 We have two excursions organized from Wrangell. The first of these, on August 8th, Louisa and myself are taking a jet boat up the impressive Stikine River which is around 460 miles long and mostly in Canada. It was used as a route through the coastal mountains for thousands of years. However, it is very shallow and freezes during the winter. It is usually navigable from May 1st to October 15th by shallow draft vessels which today mean jet boats. Our trip, organized by Breakaway Adventures will take us upstream 35 miles to the Canadian border. On the day of our trip we awake to heavy rain which does not bode well. However, it comes and goes and we have a dry ride in our tender from the marina to the downtown office of Breakaway Adventures. We and four other passengers plus driver board the jet boat which can run in as little as six inches of water. The outer estuary of the river is known as the flats where the river has multiple courses which move slightly over time as the river meanders. The water is the color of chocolate milk and huge numbers of trees, toppled into the river by undercutting its banks, lie stranded on shallow spots and sand bars. Six glaciers feed into the river. 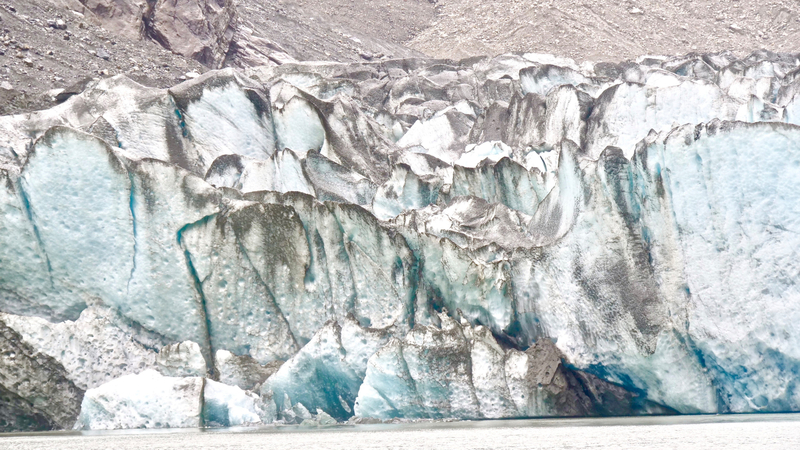 We visit the Shake Glacier and lake where wonderfully blue icefloes lie stranded. The glacier itself has retreated and it’s hard to see how it could have calved so much ice. We stop at the Canadian border, marked by a cut through the trees, and land on a gravel bank in the middle of the river. We return to Wrangle at 5 pm. The following morning, August 9th, the rain comes down even harder. It turns out to be the heaviest rain the town has experienced this year. It is badly needed as the streams are too low for the salmon to reach their spawning grounds. Unfortunately it coincides with the second of our excursions. This one is to view the bears at Anan Creek. Only 60 permits are issued daily which explains why we have had to wait until now. This time we are picked up by shuttle and driven to a similar jetboat which takes one hour at 40 mph to reach Anan Creek. The boat noses up to the beach and, once ashore, we walk in intermittent rain along a boardwalk which follows the terrain with numerous steep steps. At last we reach the overlook above the creek which has risen appreciably since yesterday due to the rain. 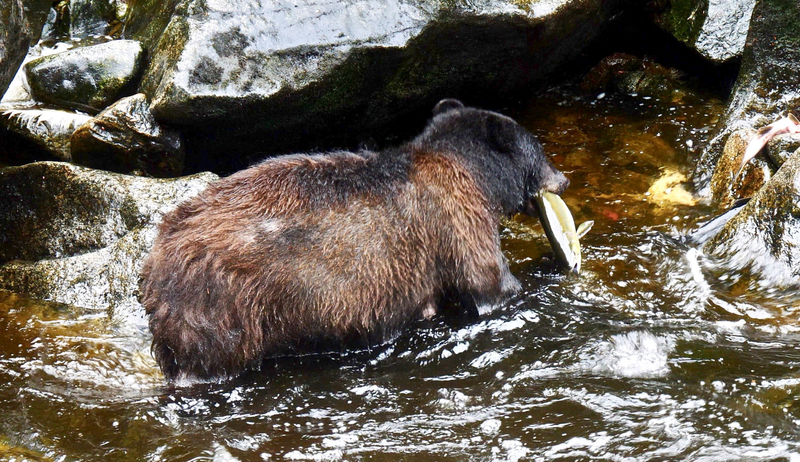 There are several black bears catching salmon and I am able to shoot some good video. We are there three hours and, just as everything appears to be winding down, a mother bear shows up with two cubs. One is swept downstream in the strong current and, after some anxious moments and plaintive cries, manages to make his way back upstream on the land and attract the attention of the mother on the opposite bank. She responds to his calls and crosses the river leaving the second cub behind. After some hesitation he sets out to follow her but then it’s his turn to swept downstream. Eventually the family is reunited. With these two excursions behind us we need to hustle to meet our rendezvous with the family on August 17th in Port McNeill 425 miles away. We are underway at 0717 in spitting rain which turns into a lovely morning with bright sunshine. It’s a long day. 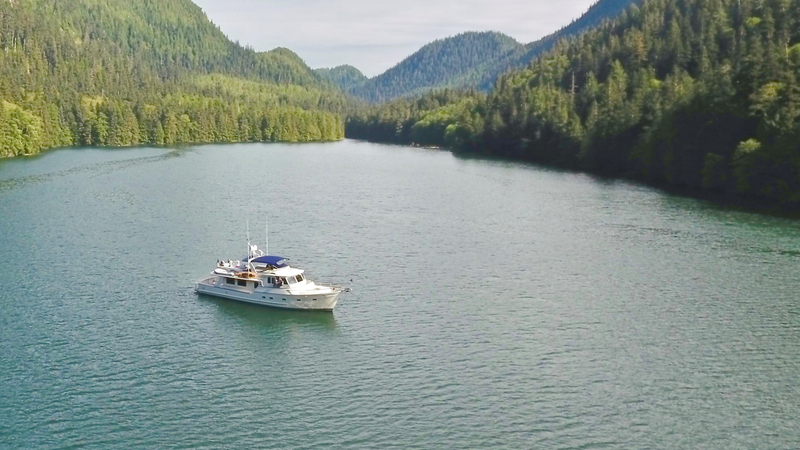 We anchor at 1947 in Pond Bay just south of Dog Island south of Ketchikan boat. The anchorage has a tricky entrance with strange names like Fish Island, Dog Island, Cat Island. Village Island, Double Island, Dog Bay, Cat Passage and Grave Point. Underway at 0811. Sunny but with a chilly wind for our crossing of Dickson Entrance - the first of two open ocean sections of the Inside Passage. The wind blows up to 20 knots but is from the north so no problem for our southbound journey and we have a comfortable ride. We cross the Canadian border at 10.45 Alaska time. (11.45 Canadian time). We pass through Metlakatla Channel and, as usual, do not spot a single person on shore or in the marina. We officially enter Canada by phone in Prince Rupert Harbour and tie up in the town marina at1525 Canadian time. Another lovely sunny morning. Underway at 0753 new time. Very calm but strong tides. There is masses of wood in the water - so much that we have to hand steer through it. The tide is with us at the the start but turns against us and is very strong. The tidal range today, between high and low tide, is more than 21ft. Our speed is down to less than six knots at one stage (from being over 10 when tide with us). We stay within 50 yards of the bank to mitigate the effects of the adverse current. Water depths this close to the bank exceed 100ft. Looking through the salon windows is like watching a moving tapestry of green trees. 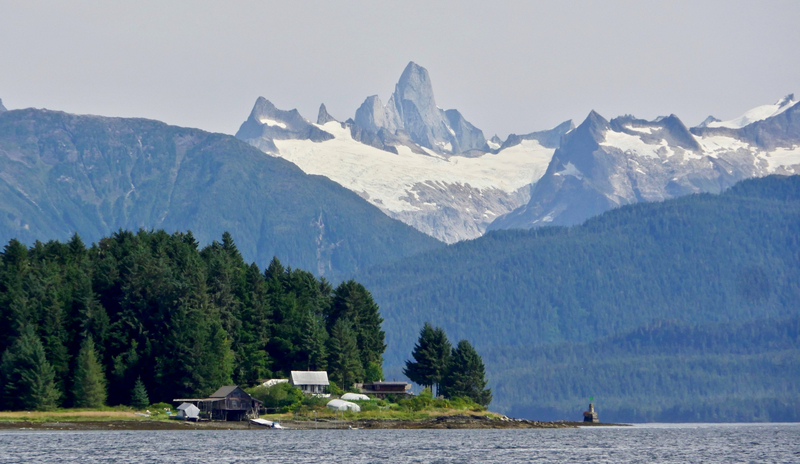 At 1623 we anchor in Coghlan Anchorage behind Promise Island, just around corner from Hartley Bay. Sunny morning with high clouds. Keeping inshore makes up to two knots difference in speed. Today’s route takes us through McKay Reach, Frazer Reach, Butedale Passage, Graham Reach, Heickish Narrows and Findlayson Channel. Some being sections of Princess Royal Channel. We are overtaken by the BC ferry. Northern Expeditions. We meet Fleming 55, Mola Mola heading north and talk on the VHF. We anchor in Bottleneck at 1524. We awake to find ourselves enveloped in dense fog. This slowly lifts in the anchorage as the sun warms up, producing lovely lighting effects including a fog bow. We are underway at 0842 to find thick fog in Findlayson channel with visibility less than 400 yards. We feel our way through it using radar. We are briefly exposed to the open ocean just north of Bella Bella but the seas are calm. We encounter numerous processed, ie not natural, logs everywhere. We arrive at Shearwater to find the slips are full so we anchor off at 1402. Up anchor at 0817. Gloomy morning with fog hanging just above water level so visibility not a problem. It remains a grey day almost all the way to Fury Cove at Schooner Retreat where we anchor at 1339. It is time for our second open ocean crossing at Queen Charlotte Sound. We are underway at 0734. Initially the waves are sloppy and confused but the situation improves after we pass Cape Caution at 0920 and waves moved further aft. The conditions are quite reasonable but we are glad we are not proceeding north. We tie up in Port McNeill at 1430. We had gone to a lot of time, effort and money to arrange for my daughters and grand-daughters to meet us in Port McNeill to celebrate my birthday. I receive an e-mail to say that my daughter, Jackie, who has a British passport, has not been allowed to board her flight in Denver because she lacks an electronic permission to fly. No one I know has ever heard of this requirement which has apparently been in force since September 2016. So, for all those Brits out there (and maybe Australians also) be aware that you won’t be allowed to fly into Canada unless you have an eTA. This opaque piece of bureaucracy ruined a once-in-a-lifetime event for our family. Several people came by boat in Port McNeill and mentioned they liked the videos and used them to plan their trips. Happy Birthday. She is well into her 5 hour drive home home after her aborted journey. Nicky, my second daughter, sends a message to say her flight is delayed in Vancouver due to wildfire smoke. I walk up to the supermarket to buy a cake to substitute to the one Jackie had been bringing. Nicky’s group finally reach Venture at 3.30 and we leave immediately for Pierre’s in Echo Bay to reach the party in time. Except for some white-sided dolphins who played around the bow for longer than usual, we had an uneventful trip in Venture across to Echo Bay where we arrive a couple of minutes before 4.30. Happy Hour starts at 5pm. At the Pig Roast, Tove gave me big introduction re my birthday”. Today is my actual birthday. We arise slowly and get underway just before the check out time of 11AM. 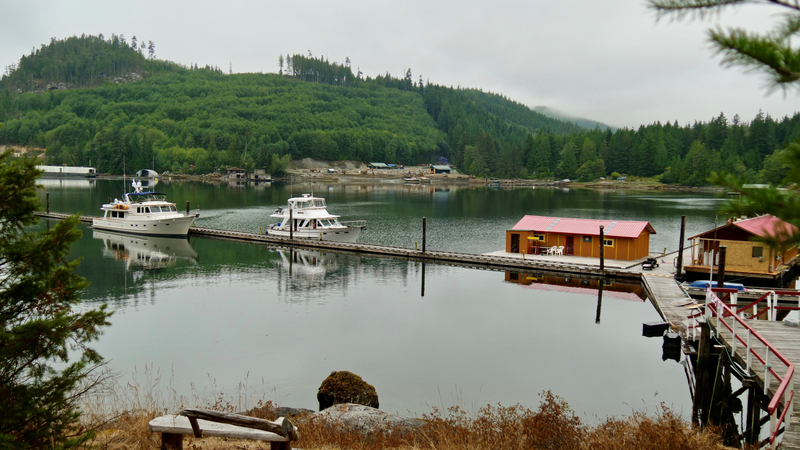 We anchor in Joe’s Bay on Eden Isle, at 1258 and spend the day using kayaks and taking turns driving the tender. 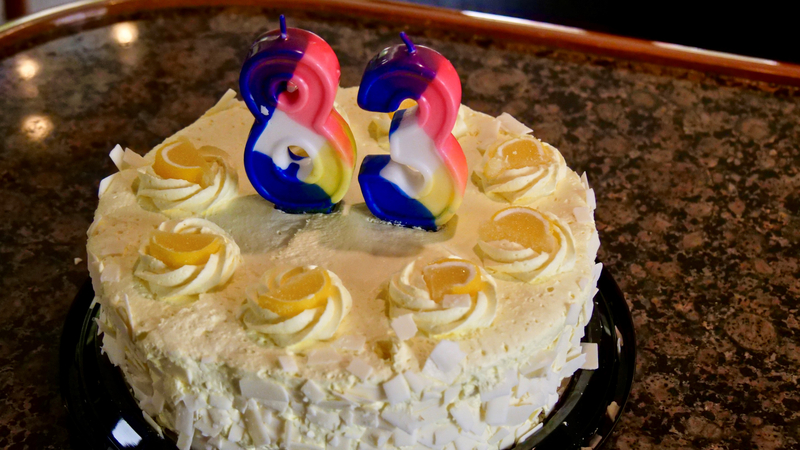 We demolish the birthday cake decorated with two candles. We awake to dense fog. We get cautiously underway at 0945 and feel our way with visibility less than 200 yards. We go via Black Fish Sound in the hope of seeing orca but can see nothing in next to zero visibility. Some radar targets traveling at 25 knots pass within 250 yards of us but we fail to see them. We just feel their wake. We spot one target with a barely visible radar footprint the size of a seagull. We track it using ARPA and find it is stationary. We think that maybe it is a large log. It turns out to be a small boat anchored in the fairway, fishing, with red ball over bow. Go figure! It takes just 14 seconds to travel 200 yards at 25 kts. Visibility improves slightly as we approach Port McNeill where we tie up at 1322. We all arise at 0430 and Chris takes our guests to Port Hardy airport at 0500 to catch their flight at 0630. Take off is delayed due to fog and smoke but they make their Vancouver flight. More than 550 wild fires are reported to be burning in BC. The smoke is not too bad where we are but sun is big red ball. We get underway at 1025. 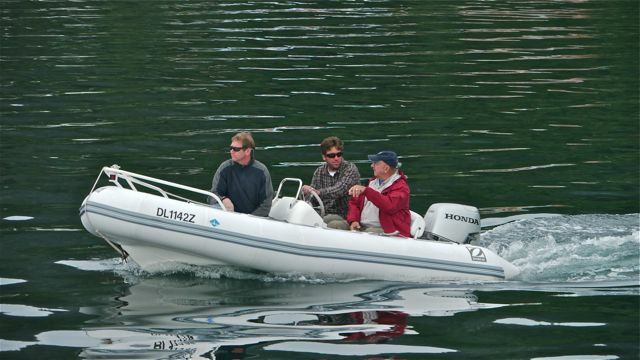 Transit of Johnstone Strait requires concentration due to reduced visibility and heavy traffic - most without AIS. We turn into Port Harvey and tie up at the marina at 1402. I had received a message from Gail that her husband, George, had died unexpectedly of a heart attack just two weeks ago so, of course, we did not expect any services. We had been shocked by his passing and our visit was somewhat akin to a pilgrimage. There were two other boats who were there for much the same reason. We felt very sad and lifted a glass to George’s memory. Underway at 0912. The other two boats take off around the same time leaving Port Harvey marina deserted. Sad. I take photos. It is a little misty and chilly but not so smoky. Wind in Johnstone Strait is up to 30 knots behind us. We are very glad we are headed south and not north. The water is seriously choppy in places especially around Race Narrows. We pass a long log tow traveling at 1.5 knots. There are numerous fishing boats including seiners and bow and stern pickers. The smoky conditions begin to return as we travel south but not too bad. With the current behind us we reach speeds of close to 16 knots. This makes us early for Seymour Narrows and we pass through with 7 knots running in our favour. There is no problem in the narrows but strong swirly currents just south of them which continue for several miles. We turn into Gowlland Harbour and anchor at 1502. There are quite a few large bpats already anchored here. A small breeze arrives after a calm evening. 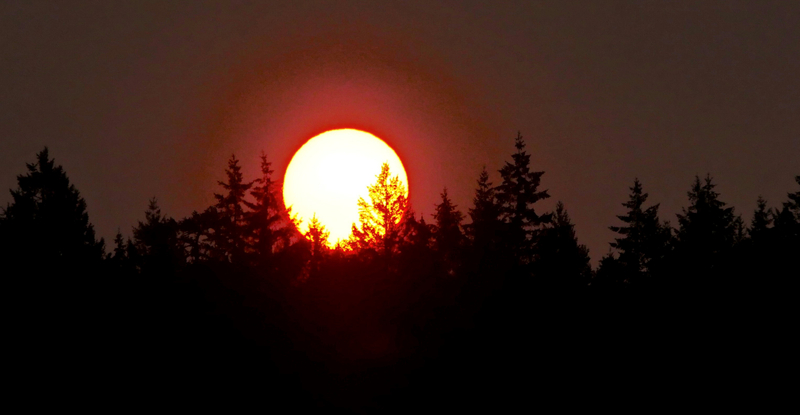 There is less smoke but sun is still a reddish ball at sunset. When we arise at 0600 it is a lovely sunny morning with clear skies. We are underway at 0642. Very strong currents against us in the strait as we pass the town of Campbell River. They swing Venture as much as 40 degrees off course. Our speed is down to less than4 knots from our usual cruising speed of 9.5. We hug the shore of Quadra Island to avoid the worst of the adverse current. We enjoy an uneventful cruise down the Strait of Georgia under comfortable conditions to Nanaimo where we anchor at 1508. The anchorage is crowded and it is hard to find space. We go ashore in the tender for dinner at the pub. We talk to people on small power boat with a hailing port of Peel, Isle of Man. We also see a sail boat with the hailing port of Southampton. Underway at 0805. We decide not to go through Dodds Narrows due to heavy traffic. Instead we stay outside and come in through Porlier Passage and anchor in Montague Harbour at 1138. While underway we see concrete being delivered to a lighthouse on an offshore island by helicopter - one bucket at a time. It is a lovely day. Not too hot, blue skies with puffy cumulus clouds. Montague Harbor is popular at this time of the year. I do a quick count and count 157 boats at anchor and I’m sure I missed a few. Underway at 0802. Overcast with light rain which was a surprise. Lots of huge ferries to be avoided. We arrive at Delta at 1219. Brian is here to greet us and directs Venture into his newly acquired floating shed. This marks the end of our summer cruise during which we have covered 3,808 nautical miles with 59 nights at anchor and 46 nights at a dock. Louisa and I go blackberry picking. Time to go home and figure out how to deal with more than 8 hours of raw video footage! Journey’s end. After 3,808 nm Venture at Delta on Vancouver Island.